Deckard "For A Better Tomorrow"
Deckard took his time – after 3 successful EPs, numerous sampler contributions and remixes, the well respected producer from Munich releases his long awaited first full length album “For A Better Tomorrow”. At a running time of 53 minutes, 12 songs are seamlessly and tightly packed resulting in a compact album that keeps a continuous arc of suspense. Furthermore, Deckard is able to give his album a timeless touch. “For A Better Tomorrow” sounds contemporary and mature – like a gloomy yet prudent version of the future. While, at the same time, the partly sample-based titles and spoken word bits are traces into the past. With the album Deckard aka Attila Makai proves once again that he is an exceptionally talented musician, who is able to stand in the top ranks of producers on an international level. “Noir Desire (Part 2)“ is the only track of the album which was released previously on one of Deckard’s EPs (Future World, 2009). Like no other song on the album it defines his trademark sound: deep, grumbling bass lines, long-drawn-out pads, combined with monotonous, trippy drums. "Günesim“ – the only non-instrumental track on the album – features the beautiful female voice of the Turkish singer Deniz Cagli. It is a cover version of a song that became popular in the mainstream as being featured in the German movie “Im Juli” (In July) by Fatih Akin where it is performed by the famous German-Turkish actor Idil Üner. Deckard’s version translates the folky track into the present with a dubsteppish tempo. The instrumental sneaks along in deep manner and works as a perfect background for the vocals. Next, “Andromeda”, which will released as a limited vinyl 12“ with remixes by Bit-Tuner and the Russian producer team Demokracy in late November, is special in its own way. It’s a Sci-Fi Reggae Dub Downbeat track, that has no equals. It will be a delightful track for beat fanatics as well as Dub connoisseurs worldwide. On further tracks like "The Dawn“ Makai proves his versatility and demonstrates that his music is not only compatible for home listening but additionally should work for DJ use as well. “Leaving”, one of the older tracks on the release, moves forward with a driving beat and bridges to the last third of the album that turns out to be a bit more experimental. 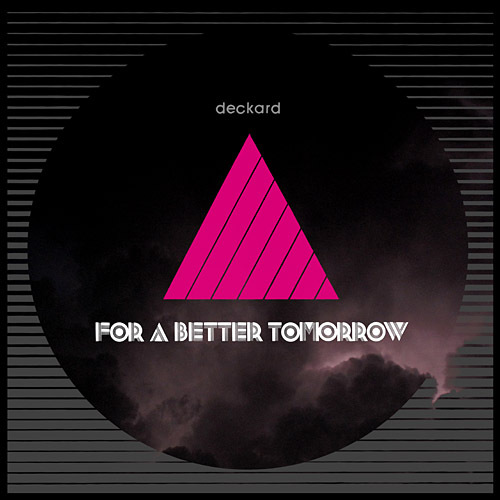 Deckard’s “For A Better Tomorrow“ is an astonishing debut where Makai delves into every song with abandonment and sensitivity which helps him to master his technique like few others. The fate of this album remaining as a timeless classic should be up to the listeners. But it will definitely be an album, that they will return to in order to lose oneself in his soundscapes again - whether it’s after the first hearing, after a couple of days or even after a year. „For A Better Tomorrow“ is dedicated to Makai’s pregnant defacto partner – let’s hope for a successful “debut” here as well. The album will be released late december / early January on the German Electronica label Equinox Records on double vinyl and digitally.